I've seen several blogs commenting on the community raised by bloggers. I've found this among knitting blogs and also in other areas. I regularly meet cyber friends from a large international forum where I participate. Both these areas represent a caring community. Knitters and other creative folk are generous.and kindhearted. I've enjoyed Blogtoberfest and enjoyed finding so many interesting new blogs.. Some of these show creativity in ways I would not normally attempt. All have beautiful work to display, yummy recipes to try, words of encouragement and sympathy when down. I've entered a few giveaways and refrained from others. When I returned from my weekend babysitting (and more of that later when I've had a sleep) I found two delightful emails in my inbox. At Selina's Vintage I entered a giveaway which I won. Some vintage fat quarters, some vintage buttons, a needlecase. Photos to follow when the parcel arrives and is collected from son's PO box. I have been debating making myself a needlecase for a couple of weeks now. A serendipitous prize indeed. I used to have a lovely, very vintage needlecase given me by a great aunt many years ago. It was a red felt Red Riding Hood. I used it for years, but somewhere it disappeared and I don't know if I still have it. Not only that but the knitting powers have confirmed that I do indeed take part in a Long Lacy Summer. I made a donation to Knitters for a Cure who were doing relay for Life in Perth. 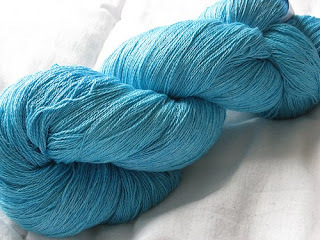 I have won some lovely lace yarn with 50% silk and 50% cashmere, 1300 yards. Absolutely gorgeous. Now I made a donation here and was entered. However, I donate to this cause every year and hadn't done so yet. It supports breast cancer research and my sister is a 12 year survivor although she's had problems at times. I have also supported Movember where one son grew the most amazing moustache. Another cancer cause. Yet another son has several times shaved his head for Canteen and I've supported him there too. So the prize was not the main attraction. These knitters knit during the relay. They have raised over $4000, a fantastic effort. Congratulations. Thank you to Selina and to those who donated prizes for the cancer relay and to those who participated in the relay. Congratulations Jan on your prizes - well deserved and well-timed.